Someone above must be looking out for James Crawford. "I'm glad I made it, but how?" Crawford wondered. The 63-year-old somehow survived a piece of metal being lifted by a construction-crane taking the roof of his van while he drove along the New Jersey Turnpike Wednesday morning. "Everything was sawed off but I was still there," Crawford said. James Craword survived a freak accident on the New Jersey Turnpike Wednesday morning. A construction crane holding a steel beam took the roof off of his van. Crawford, who works for Tri State Knife in Robbinsville, N.J., was driving north on the turnpike just before 8 a.m. when a steel beam smashed into his van -- ripping the roof off, New Jersey State Police said. According to state police, a construction company was using the crane to lift a piece of steel on the side of the turnpike at Exit 8 in Mercer County when for some reason the beam swung too far and into the line of traffic. 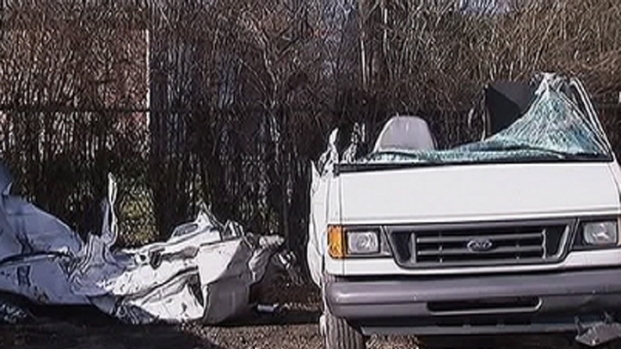 To see the remains of the white Econoline van Crawford was driving, it seems impossible that the driver could survive. "I can't believe he walked away," said tow truck operator Tony Alfano. "I mean the entire passenger side and the roof were peeled off the van completely. It looks like a convertible." Not only did Crawford survive the bizarre accident, the North Jersey resident walked away with eight stitches to his head, cuts to hand and a broken thumb but otherwise was unscathed. "I couldn't believe that this guy [Crawford], when we pulled up, was outside the van and sitting on the guardrail," Alfano said. Crawford was already treated and discharged from the hospital by 1 p.m. Wednesday, authorities said. "I feel blessed. I'd say that's a blessing to be alive," Crawford said. Crawford and his family also thank him being alive to the one motorist who stopped to help. "This one guy he stopped and he assisted my father," said Crawford's son Jermaine Cobb. "He helped him. I want to thank him personally from the bottom of my heart. I do hope to get to meet him one day because he’s a great guy whoever he was." State police are investigating the cause of the accident. The construction company that was working on the project, PKF-Mark III, Inc. out of Newtown, Pa., also told NBC10 that they will conduct their own internal investigation into the incident. However it happened, Crawford's survival is nothing short of miraculous. 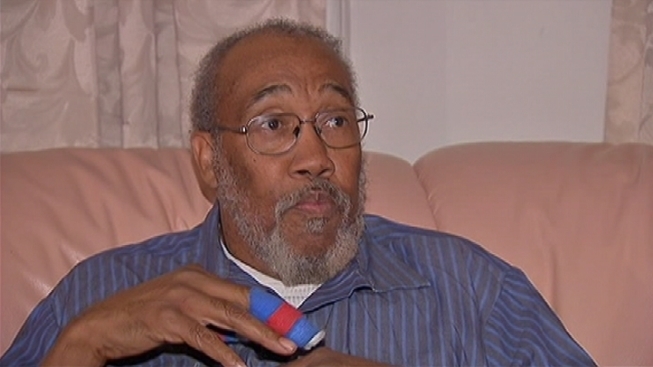 "I definitely think it's a miracle," Crawford said. "That there's a purpose for me being here." And don't think this will slow Crawford down. He says he plans on being back to work by Monday.